Over 100 million acres of developed land exists in the U.S., which has generated 25 million acres of impervious area. While the area of impervious cover only represents about 2% of the land area, the impacts to the nation’s waters, especially in urban areas (where most of us live) go far beyond this proportion. These impacts will continue to happen, as will impacts from continued development, until we find new ways to make stormwater infrastructure investments cheaper, faster, and more effective. A new approach has been developed to meet this challenge. This new approach to implementing green stormwater infrastructure (GSI) at a large scale referred to as “community based public-private partnerships” or CBP3s places community benefits as the highest priority. A guide on this approach was released on Earth Day (April 22) of 2015 and is the first document dedicated to this approach. 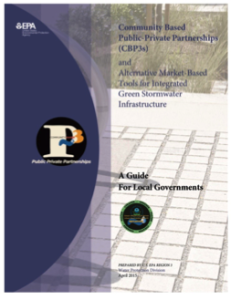 The guide, titled Community Based Public-Private Partnerships (CBP3s) and Alternative Market-Based Tools for Integrated Green Stormwater Infrastructure: A Guide for Local Governments, provides an in-depth overview of the CBP3 approach. It is my belief that this new approach to implementing GSI, as well as other environmental and social infrastructure, will become the norm in the future – this is truly a game changer in every sense of the word. Considering that the White House has repeatedly cited this approach as an innovative way to meet the growing demands in the Clean Water sector, I believe I’m not alone in my opinion on the significance of the potential that the CBP3 approach has now and in the future. So what is a CBP3 and how does it work? In a basic sense, this approach flips the traditional P3 approach on its head by placing the benefits of the public sector – and the community – at the center of the framework. Rather than rewarding the private entity in the P3 arrangement, all the profits gained from efficiencies or cost savings generated in a P3 project, the CBP3 approach take these savings gained and re-invests this money back into the program. By doing so, more work is generated, so more GSI gets placed into the ground and the private entity gains more revenue (by doing more work overall). By applying this approach in the stormwater sector, the CBP3 takes advantage of all the inefficiencies that currently exist in the status quo method of implementing stormwater infrastructure investments. The traditional method of implementing stormwater projects is for the jurisdiction to study their watersheds, identify sites for implementation, develop a request for proposal (RFP) for design services, go through the environmental permitting process, send a final plan out to contractor for bids, and then build the project. This is done for each project, as if each project were not associated with the total outcome of getting more stormwater infrastructure in the ground to address stormwater pollution. Each project carries its own costs associated with procurement and administration as well as “change order” costs that arise by contractors who find design flaws, run into unforeseen constraints, or just a different way to build than the design envisioned. The CBP3 approach does not use a traditional procurement process, but rather, seeks to integrate these steps together under one umbrella program and start putting Best Management Practices in the ground just as soon as they can cite and design them by using a handful of standardized practices that address a majority of the situations and project conditions that will be encountered. But doesn’t this come at a cost of quality? No – in fact, the program is built around the premise of “availability payments”, which means that the CBP3 partner doesn’t get paid for their work until the infrastructure is “available” to perform as expected. The dimension of scale also comes into play in the CBP3 approach. In the past, stormwater runoff has been seen as a minor issue – as evident by the fact that it took 25 years after the Clean Water Act was passed into law to start regulating stormwater runoff. More recently a trend towards appreciating the growing impacts of urban stormwater runoff on the health of our waters and the toll excess runoff takes on downstream infrastructure has developed. As regulations become more stringent based upon this identification of the significance of stormwater pollution, the need for an expansion in stormwater management infrastructure is growing – but up until this time, stormwater has been seen as a “mom and pop” or “boutique” industry with little consideration for trying to reduce efforts (and therefore costs) in a per unit metric. The CBP3 approach challenges this limiting view of stormwater infrastructure investment by looking for large-scale outputs rather than piecemeal project-by-project means to attempting to address regulatory needs. By focusing on large-scale efforts, economies of scale are gained which further reduce costs. The CBP3 is based upon a model developed in the mid/late-1990s to address the quality/quantity of military housing in a program referred to as the Residential Community Initiative (RCI). This framework lets the government and the private sector do what each do best by providing the private entity/developer land on which to build housing and an ability to leverage military housing stipends to obtain low-interest private investment to fund the development/redevelopment of military housing facilities. This approach, developed and deployed by Corvias Solutions, has been deemed a success, as evident by the amount of housing now available in many military facilities as well as positive feedback from the families who live in this housing, who state that the quality of housing has increased as has the responsiveness towards maintenance needs. This approach is now being applied in Prince George’s County, Maryland that will seek, for its first phase, to treat 2,000 acres of impervious cover with retention-based practices within three years at a unit cost that is close to half of what is often cited for urban GSI retrofits. The CBP3 entity in this case, the Clean Water Partnership, also has to meet specific goals for local jobs and minority/small business as part of their program. If goals are met for the first phase, additional phases will be added with an overall goal of 15,000 impervious acres treated within a 10-year timeframe, as spelled out in Chesapeake Bay nutrient and sediment Total Maximum Daily Load (TMDL) requirements. The original price-tag for this scale of effort would be well over $1B when using the status quo approach for urban GSI retrofits, but with cost-savings due to economies of scale and a streamlined procurement program, these cost could be driven far below those expected based upon conventional wisdom. This is clearly an exciting time for the stormwater sector on many fronts – emerging technologies, evolving regulatory landscape, rising awareness – and now we can include the dimension of enhanced infrastructure investment in that list. Going green in a big way has never had such promise both for the bottom-line as well as the value to communities. Seth Brown is the Principal and Founder of Storm and Stream Solutions, LLC, a consulting firm providing a range of services from policy and infrastructure finance analysis in the water sector to the development and delivery of technical and policy-related training focused on topics such as stormwater and public-private partnership arrangements. Through his consulting group, Mr. Brown was a major contributor for the recently released EPA Region III guidebook, Community Based Public-Private Partnerships (CBP3s) and Alternative Market-Based Tools for Integrated Green Stormwater Infrastructure.